Posted on February 1, 2016 by Lucy S.
The U.S. military has plenty of reasons to feel a little salty towards Iran, but this pretty much takes the cake. 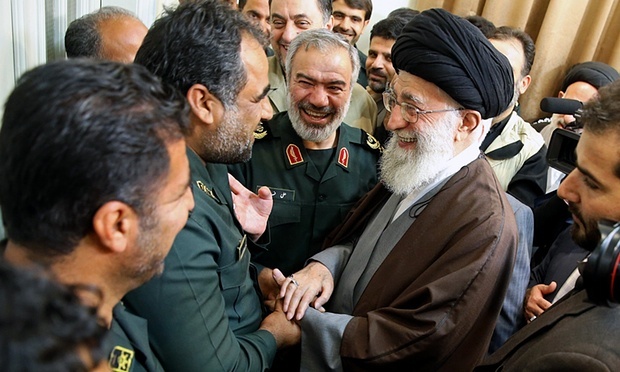 Iran’s supreme leader Ayatollah Ali Khamenei awarded the Order of Fat’h medal to the head of the Iran Revolutionary Guard and the four members who seized ten U.S. sailors in mid-January. In a tweet celebrating the awards. Khamenei also mislabeled the captured service members as Marines. The state has been doing a sort of victory lap ever since it found two American vessels stranded in its waters due to some type of malfunction. While Iran had the U.S. sailors in its custody, it broadcast video footage of the capture on a state-owned news station as well as a clip of one American apologizing for what they had done. The Order of Fat’h medal is awarded to only Iran’s greatest war heroes. Historically, most of them were only awarded during the Iran-Iraq war. To bestow this medal on the individuals who captured Americans at gun-point is quite telling. Defense Secretary Ashton Carter recently revealed that he was “very, very angry” about how Iran handled the situation with the U.S. sailors. We can only imagine that Iran’s latest stunt isn’t doing much for his blood pressure.